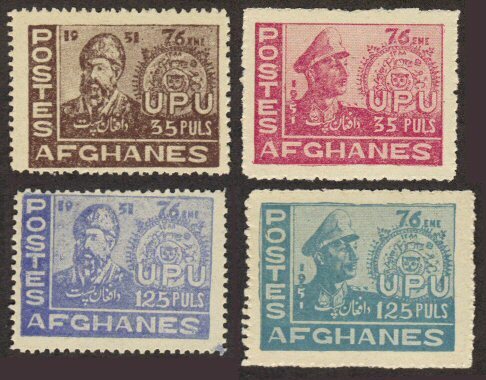 Afghanistan #394-97 mint never hinged complete set. UPU. 2017 catalog value $4.20. 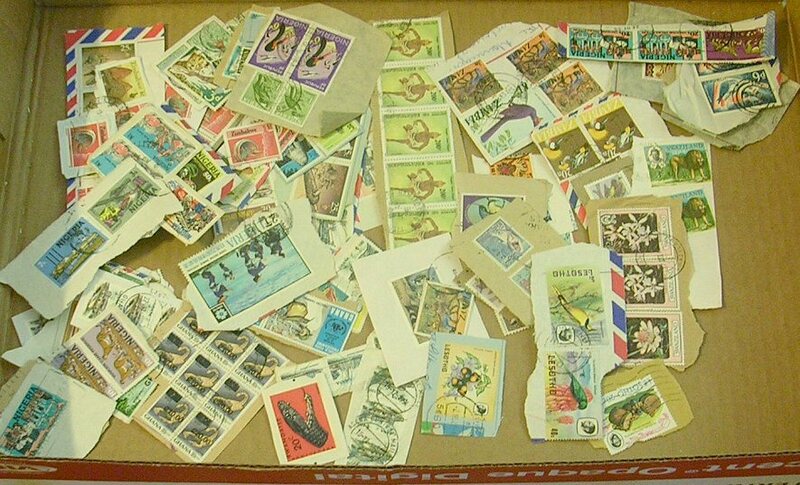 A colorful mix of stamps from Africa ON paper. Looks like mostly 1970s to 1990s issues, maybe a few older. A less common range of countries than usual, with a few from Mali, Sudan, and a good range from Ghana, Nigeria, Zambia, Zimbabwe, Lesotho, others. 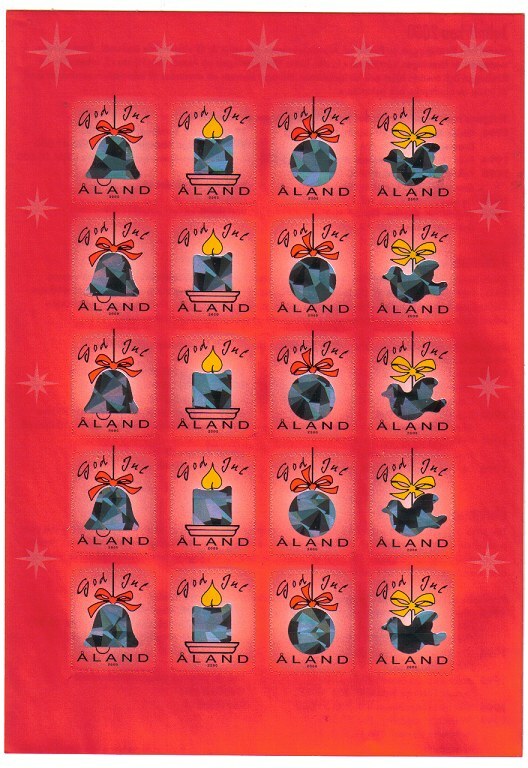 A lovely Christmas issue - the complete sheet of self-adhesive Christmas seals from Aland. Year 2000. Has a sort of metal foil for the center of the ornaments. Eye-catching. 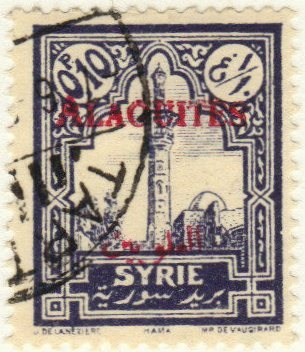 Alaouites #25 used single. 2017 catalog value $2.25. 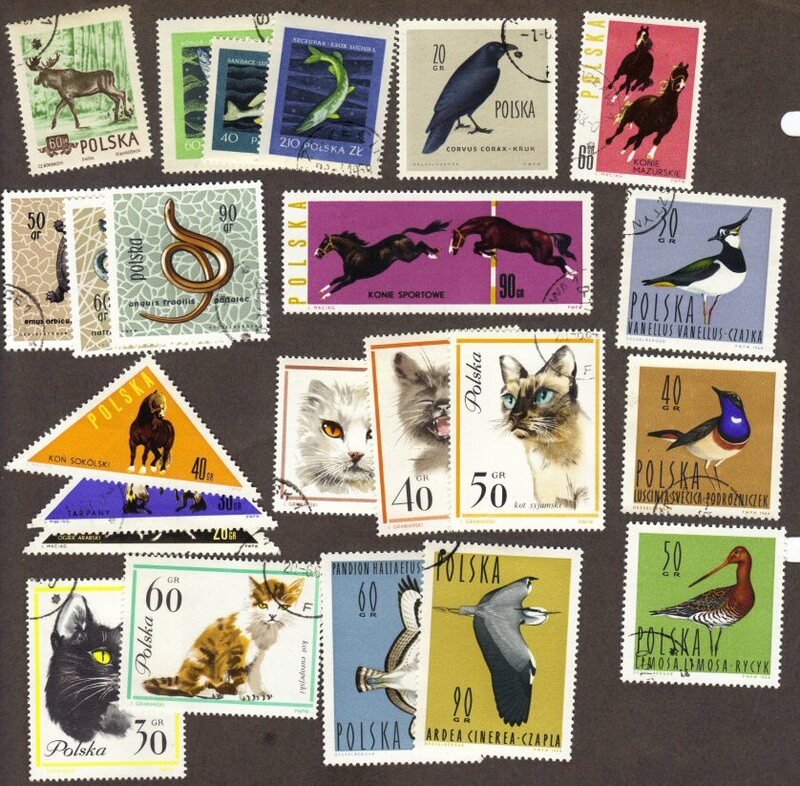 A batch of animals on stamps from Poland - all different, looks like mostly 1960s-70s used. Cats, horses, birds, reptiles, more. 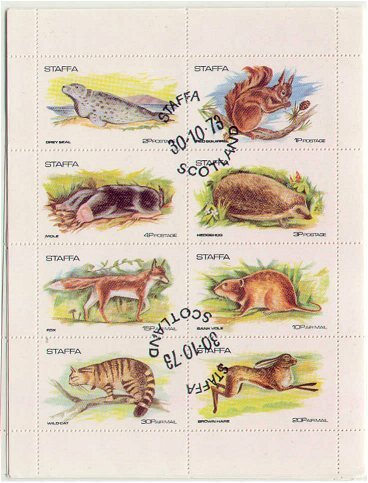 A fine sheet of 8 stamps from Staffa, showing animals, including wild cat, fox, brown hare, mole and grey seal. 5 copies available. 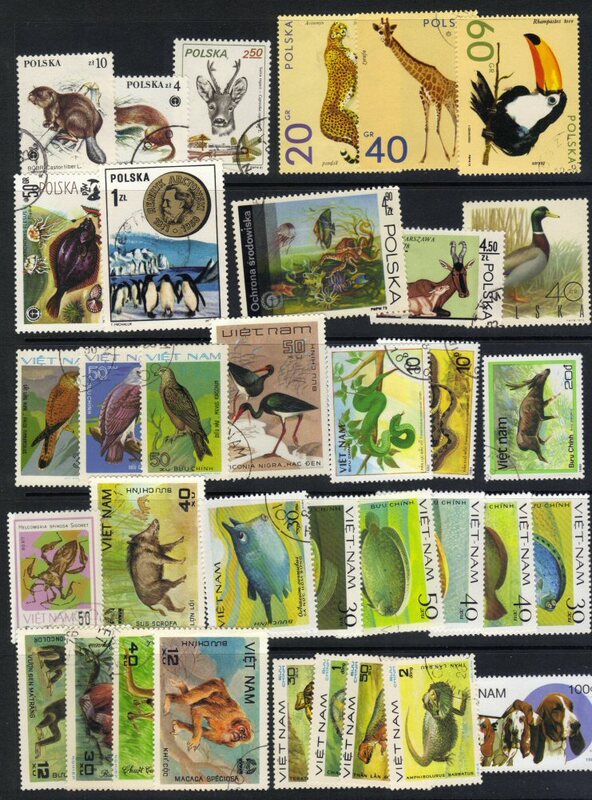 A page of stamps depicting animals. This batch is from Poland and Vietnam. Stock page not included, to reduce shipping cost. 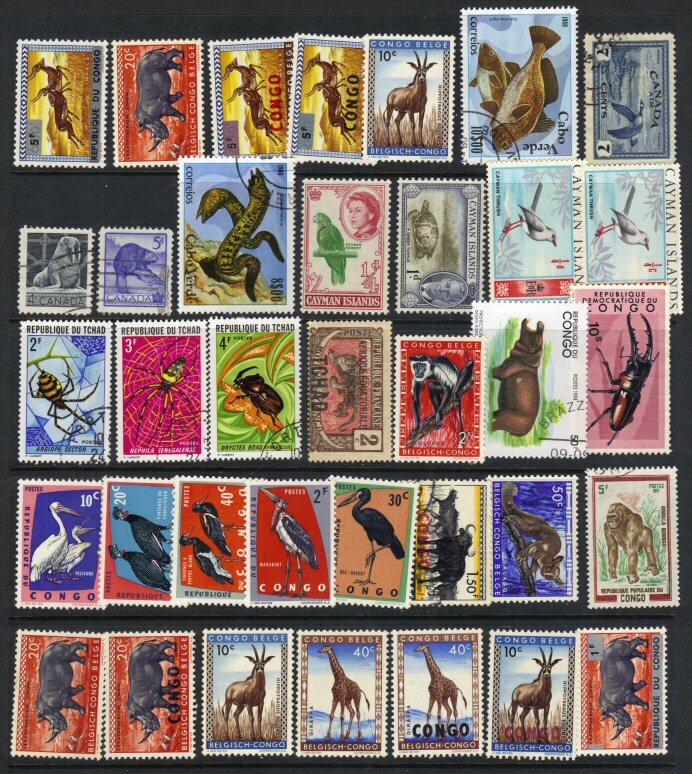 An odd mix of stamps from around the world, all showing animals. Good range of countries; animals range from butterflies to tigers. Used, maybe one or two mint ones. 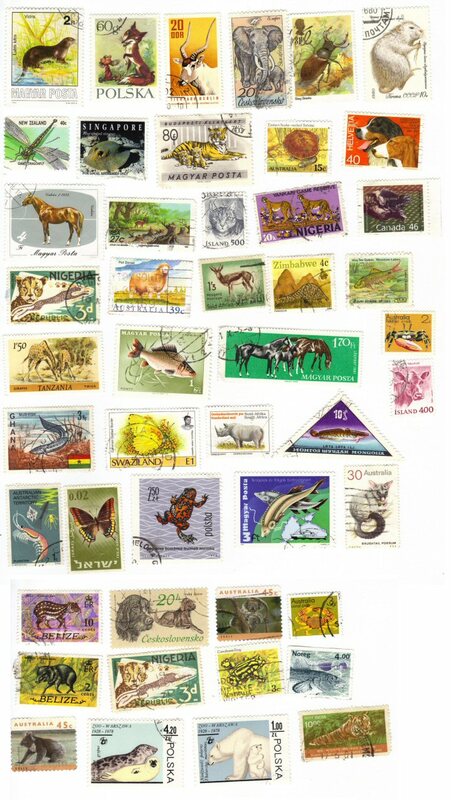 A batch of stamps showing various animals (fish, bugs, hippo, rhino, birds, etc): some mint, some used … from Canada, Congo, Chad and other countries. Stockpage not included, to reduce shipping cost. 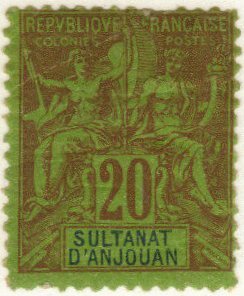 Anjouan #28, mint hinged, 10c surcharge. 2017 catalog value $5.75. 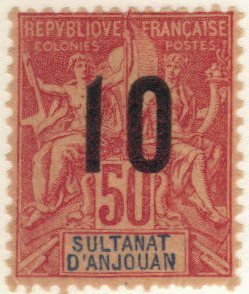 Anjouan #9, mint hinged, 20c single with faint crease. 2017 catalog value $17.50. 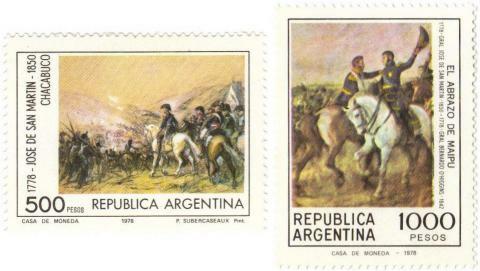 Argentina #1227-8 mint never hinged, complete set. Horses. 2017 catalog value $5.50. 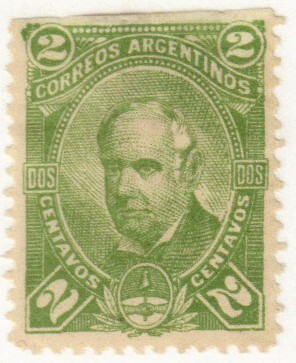 Argentina #58 mint hinged. Faults: Straight edge at top, and a thin across top. 2009 catalog value $25.00. 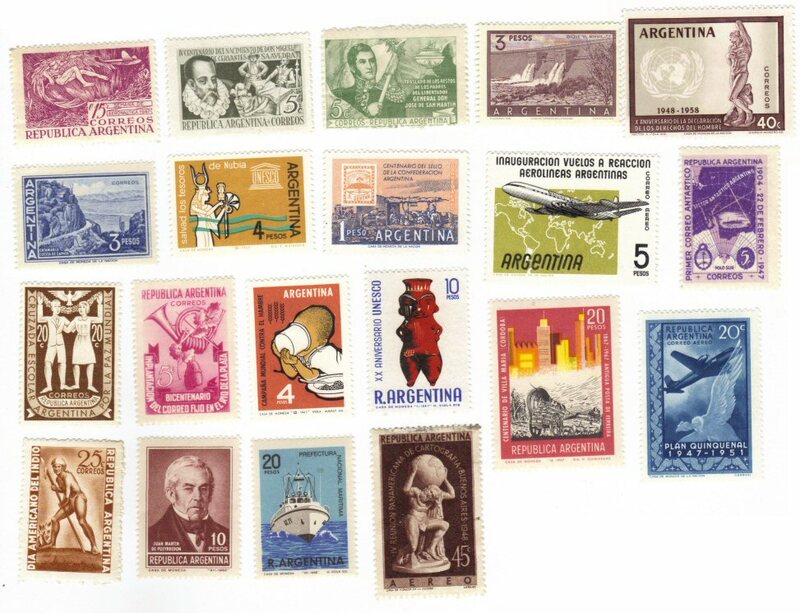 A little mix of mint (hinged) stamps from Argentina, mostly commemoratives. 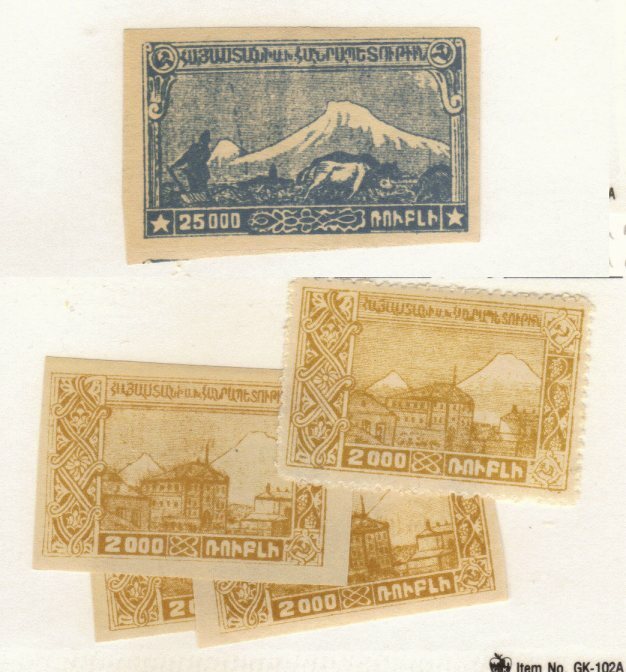 Armenia #288 (x4) and #293 mint hinged singles. 2017 catalog value $9.00. 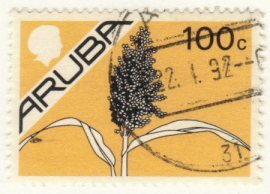 Aruba #14, used. 2017 catalog value $1.25. Ascension #445-48 mint never hinged, complete set. Ships, Sydpex overprint. 2012 catalog value $6.55. 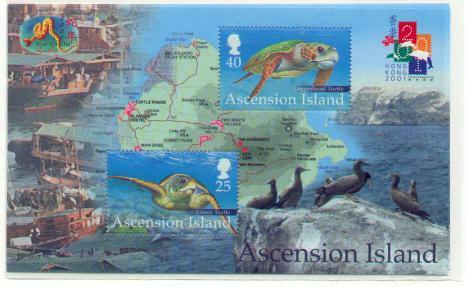 A mint NH copy of the "Hong Kong 2001" souvenir sheet from Ascension Island. Shows turtles, a map of the island, photos of Ascension and Hong Kong. Scott #768, 2017 catalog value $5.25. 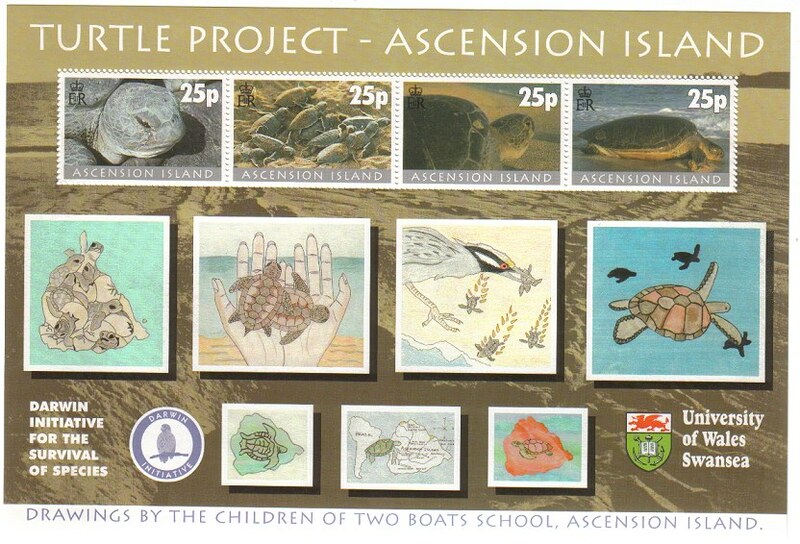 Mint sheet of 4 turtles issued in 2000 by Ascension Island. Drawings by children, cute animals -- what more could you want? ;-) Scott #754, 2017 catalog value $8.50. 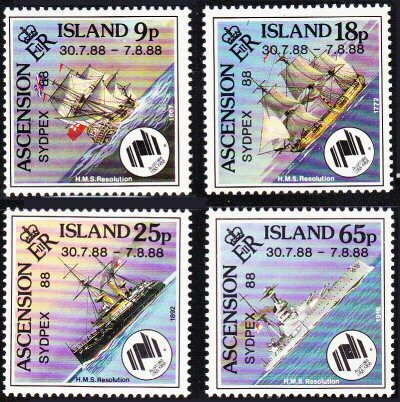 A colorful mix of stamps from Asia ON paper. Looks like mostly 1970s to 1990s issues, maybe a few older. Good range of countries, with some from China, Taiwan, Korea, Philippines, Thailand, Hong Kong, Malaysia, Israel, Turkey, others. No Japan.